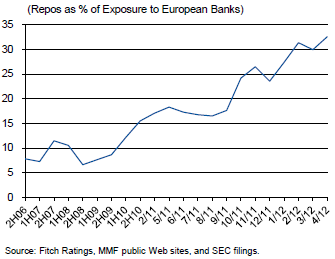 Here is a quick update on US money markets' exposure to EU banks. The percentage of funding provided to European banks via secured lending (repo) vs. unsecured funding (commercial paper) continues to grow. US money funds are desperately looking for any yield and EU banks may offer a couple of extra basis points. But the funds will increasingly demand collateral and execute this lending via tri-party repo for additional security.